Newsfeeds are accessed from the email tab. Opera is a slightly different breed of application from IE7 and Firefox in that it's not just a Web browser, it's an Internet suite. 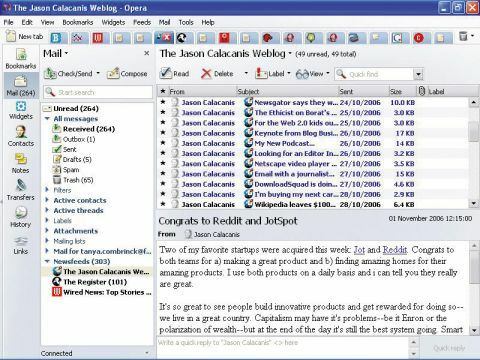 This means that you can have one tab for your email, and also use it for IRC and newsgroups. It even has integrated BitTorrent support. If the idea of having just one program for all the online antics floats your boat then Opera could be the one for you. There's a lot to like about Opera. The interface is uncluttered by default, but there's a plethora of buttons that can be added if you wish. A lot of thought has been put into the default set up in terms of which features will be of use to most people. One great feature is the trash can. If you accidentally close a tab you can click this button and dig it out of a list of other things that have been recently closed. IE7 doesn't have this feature and it's less accessible in Firefox. This and the New Tab button are the only buttons on the main window - the other navigation buttons as well as the address bar appear inside the tabs themselves. This approach is preferable to the one taken by the other two browsers because it brings these elements closer to the page to which they refer, so it's a shorter distance for your mouse pointer to travel. Another neat feature is the thumbnail preview for each tab that pops up when you hover over them. One of Opera's strongest features is the mouse gestures functionality which enables quick navigation backwards and forwards using a right click and a swish as opposed to the arrow buttons. Once you've used it you won't manage without it. You have to install an add-on to get them in Firefox, and you can't get them at all in IE7. Everything is accessed from the various panels which are kept on the left of the screen, and these can be hidden away when you need the extra screen space. One thing that's present in the other two browsers but absent in Opera is a Bookmarks toolbar. It's convenient to have a row of buttons along the top of the window to facilitate oneclick access to your favourite sites, but in Opera you have to look at your whole Bookmarks folder. Newsfeeds appear inside the mail tab, and are treated a lot like email messages. To view your feeds, open the mail pane and choose the feed. It appears inside the mail tab instead of your email, with the post titles where your mail headers would be, and the body of the post inside the mail preview pane. How you feel about this comes down to personal preference, but it does have the advantage of being an instantly familiar way of working. Opera doesn't have any protection against phishing attacks just yet, but there is rumour that it will be included in version 9.1. Opera does contain a built-in ad-blocker but it wasn't as impressive as the corresponding offering from Firefox because it requires you to manually select all the page elements that you want to remove. We prefer a blocker that does all the legwork for you. The real killer for this browser is that Opera users will always need to have a second browser installed to use all the things that don't work with it. For example, Yahoo! 's new web mail viewer won't work, neither will Google Docs and Spreadsheets. The fact is, since its market share is so tiny, making new services Opera-compatible is never a top priority. This is a super browser, but these issues are certainly enough to keep it off the top spot.